← Our first Regatta, don’t you know!! Our garden is blossoming in spring, for sure! 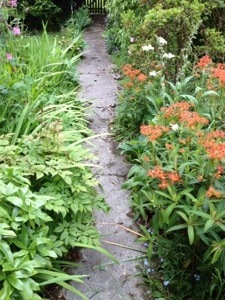 It’s growing like wildfire, and the front path which I already cleared, is already almost overgrown again! We went to the library to get a book that would help us to work out what everything is, and possibly help distinguish what to pull up and what to leave alone! Here’s what we have found so far, it’s an interesting journey! 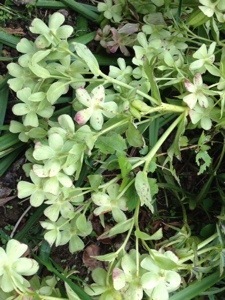 This plant is seen all over the place, it grows in abundance, and seems quite popular. It’s currently blocking one of our paths, and we haven’t decided what to do about that! 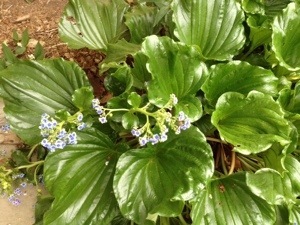 It’s a Chatham Island forget-me-not and its a native perennial. This plant is now a threatened species in the wild. Some gardeners have trouble getting the plant to flower. Both ours are flowering without any input from us! 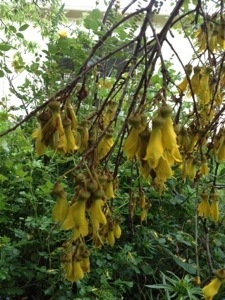 these are the blossom of the Kowai tree. 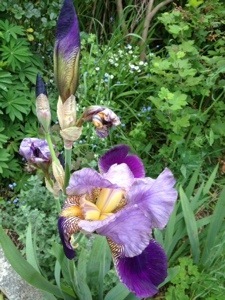 Ours has just flowered, and it’s visible from the bedroom terrace and the kitchen window. Beautiful in the sunshine too. It is recognised widespread across New Zealand as the National flower. The blossom is made more striking by the face that the tree drops its foliage just before it flowers. 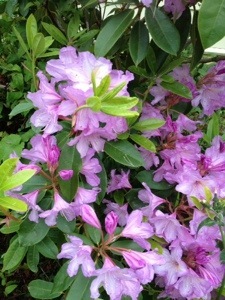 This is the good old Rhododendron. 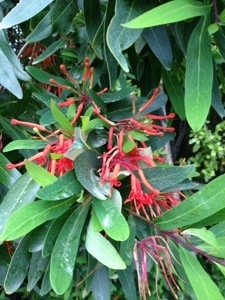 This beautiful plant is flowering at the moment right outside our dining room window. There are over 800 species, and I think we have more than one of them here in our garden. 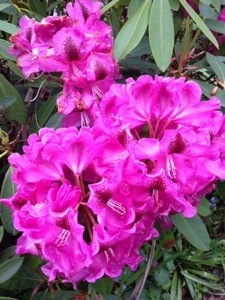 I think this may be a variant of a rhododendron too. They are planted together, so that suggests this gardener knew what he was doing. It’s wonderful watching all these mystery plants come into bloom! 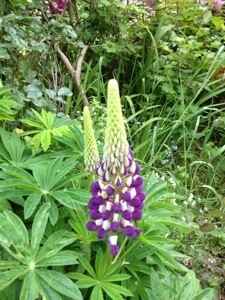 Here we have a Lupin. This plant is native to Mexico, and is a fast growing annual reaching 30 inches in height. When I weeded the mass grassy beds at the front of house I had no idea theses were here, that is how fast they have sprung up. These are Iris There is a wide ranging genus of more than 200 species of Iris, and it is actually native of the Northern hemisphere. 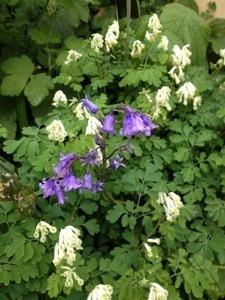 I am not wholly sure about this one, I think its Aquilegia vulgaris otherwise known as granny’s bonnets. 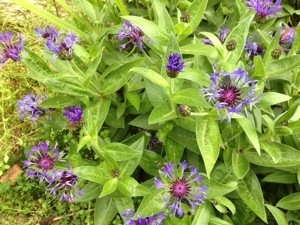 Again, it’s from Northern Europe and there are many versions, in the wild it is usually blue flowers. These little flowers are hiding in a canopy of other plants in our front garden. They are helleborus argutifolius and its a robust evergreen that is one of the first to flower in spring. It is extremely sun and drought tolerant. 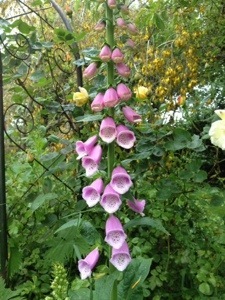 I always thought the Foxglove was a rare flower to be seen in England. Maybe I am wrong, however we have loads of them here in our garden, and they sprung up all over the place really fast! It’s lovely to see so many natural wild flowers in the garden. It’s a plant that grows 3-5ft. Ours are all well over that height! 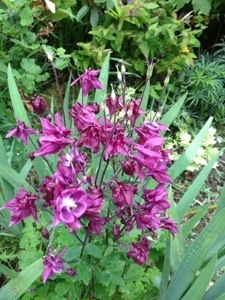 this is the Beatrice Watsonia This plant flowers through summer to late autumn. There is some doubt as to whether it is a true wild species. It took me a while to track this tree down. It lines the front and is one that helps shield us from the road. 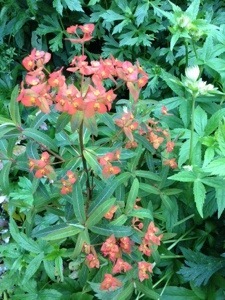 It’s called the Embothrium coccineum or Flame flower. It grows wild in southern Chile and Argentina. Bluebells grow all over the place here. I have lots in the garden, and you see them all around. They clearly aren’t a threatened species like they are in the wild in England. It’s great to see them doing so well. This is the Brachycome or blue star. It is native to Australia and it usually makes an attractive rockery plant. We have it situated under the window, by the fish pond. We have many many more, but for now that’s it. It’s hard work finding and identifying them all! This entry was posted in Our house and garden and tagged flowers, garden, plants, trees. Bookmark the permalink.